Sometimes our customers have temporary needs arise that make more sense to rent than to own, due to the short time period of equipment usage. We offer equipment rental for both portable samplers and flow meters. Whether it is a storm water site or a flow study, contact us and we'll help you select the right equipment, power options and accessories so that the information you need to gather can be obtained reliably and with ease. If you would like us to make a site visit to help with installation or setup and programming etc. We can do this as well. We are familiar with the requirements and general aspects of metering and monitoring and we'd be happy to help you. Are there other flow meters than Teledyne ISCO 2150 (Area Velocity Flow Meters) that are more economical for monitoring of flows in gravity sewers? Is this the typical flow meter for gravity sewers? No. These are what you'll want to get intelligent and accurate results. Area and velocity technology combined as well as the tried and true ISCO meter platform. 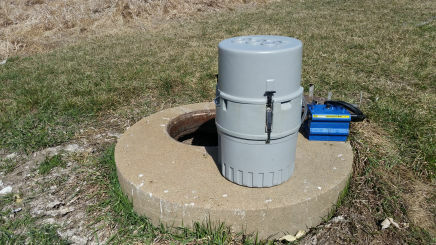 In manholes, where does the battery/module typically get placed? Does the module hang from bar/step at the top of the manhole? Correct, the electronics need to hang up as close to the top as possible. Where there are no ladder rungs or they are too low, or destroyed, we put in a stainless steel loop/eye bolt to hang things from. Meters come with a stainless cable strap with clips. Does your monthly rental fee include the cost to ship the meters back and whatever post renter tasks GPM/ISCO do to the meter after the City uses them or will there be a separate expense to ship the meters back. Meters will come with shipping tags for return to ISCO. There are no further charges than what is outlined in the proposal. The City stated their rain gauge measure on 12 minutes increments. Can the meter be programed at that same interval? ISCO equipment stores data at 1, 2, 5, 10, 15… etc. minute increments. Will a 3 month run time require a battery replacement or cost to replace a battery? It would be expected that if they select 15 minute data storage, the batteries would not need replaced. However they may for some odd reason and they would be the City's responsibility if they should. They are off the shelf lantern batteries and we will start you out with good Energizer batteries. Is the software lease for Flowlink LE or Flowlink 5.1 or Pro? 5.1 the standard software with full function. LE is very limited for analysis but totally capable for setup/programming. PRO is for server usage. The Free demo license of FlowLink 5.1 states it is good for 45 days. Does the demo license have all the bells and whistles as the purchased/leased version? Is the demo license a one-time request? How frequently could a consultant request a demo version of the software? Once a year or just 1 time? One time, it's intended to be a demo liscense to let someone see what they are getting and so forth. For record keeping, after sending back a leased software license, the user would be left with exported .cvs file and pdfs of graphs? They would still have all of the data in its normal format. The data itself does not ever lock up from usage. It's the software tool that times out. The City owns the software in this case so what they harvest for data would always be useful to them. Are there any other 'hidden' or possible costs related to the rented meters to consider? There are certainly no hidden costs. That's not how we operate. The rental and our service is intended to get you and your client what you need and reimburse our expenses and services along the way. We try hard to spell out the proposal as plain as possible. Again, that's how we do business. The Flowlink Software is NOT a cloud based service where the data is live and at your fingertips as it is happening, correct? This is used for downloading once a week and reviewing the data once it has been physically downloaded. Yes, the Flowlink is not a cloud based service. But for an additional cost, you can rent the cell module which will allow for the data to be pushed to our server. On the server you would be able to log in and monitor the data 24/7 anywhere you have internet.